We love Arnica! It is our little wonder ingredient with big benefits. As a problem-solving skincare brand, we make it our mission to encompass active ingredients like Arnica and blend them into skincare products for you to use and benefit from day after day. The sunny yellow Arnica plant is a perennial herb belonging to the sunflower family which thrives in natural mountain meadow. One of the oldest globally renowned herbal treatments… A traditional herbal therapy with exceptional tension relieving and anti-inflammatory properties. Used to help alleviate muscle aches and tension. Arnica also has wellbeing benefits and is often used in homeopathy to restore emotional balance and a sense of tranquillity. The Arnica Collection has been formulated with the combination of naturally derived ingredients and herbal therapy to relax and care for your mind and body, and to leave your skin feeling soft and cared for. It is invaluable for children, sports people, everyday incidents, and for people with aches and pains. A staple for the kitchen cupboard, gym bag and, of course, the bathroom! 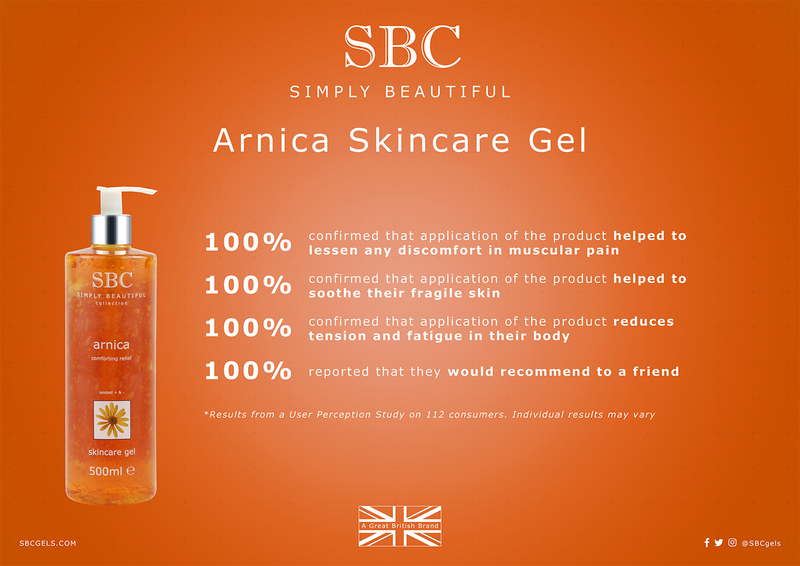 First up is our iconic Arnica Skincare Gel – probably even the ‘hero’ SBC product. Stimulates, soothes and warms the skin – it’s the Arnica Skincare Gel’smore intensive big brother. The Intensive Arnica Gel has a thick, dense gel consistency which makes it an ideal massage partner. Massage is key to relieve muscle tension, inflammation, aches and stiffness, so by massaging in this Intensive Arnica Gel increases circulation and warms muscles to comfort and alleviate tensions. Take a surge of energy into the shower with this aromatic sensation! The Arnica Shower Crème combines the natural power of comforting Arnica, with sensual essential oils to bring relief to a tired body and spirit. Releasing aromatic vapours in the steam of the shower, inhale deeply and reap the wellbeing benefits. This deep cleansing shower crème is ideal for use when muscles and joints feel fatigued, and to get Arnica to areas which may be harder to reach. It is especially beneficial after strenuous activity, such as sports, exercise or gardening. After exertion, exercise, outdoor work and strenuous activity, or to soak away everyday stresses and tension add the Arnica Muscle Soak to a bath to restore a sense of vitality. Then lean back and envelop your whole body in comforting Arnica to soothe and relax you after a long, tiring day. Arnica combined with warm water truly is a powerful combination – relaxing in warm water infused with this muscle soak will bring soothing relief to a tired body. So, let recovery soak into you as the steam rises, inhale deeply and let the Arnica aroma help calm the senses and relax the mind, and feel all tensions melt away. The Arnica Body Butter adds the skincare element to this comforting and alleviating collection. We have combined the soothing effects of Arnica, with nourishing shea butter, sweet almond oil, and vitamin E, to provide the ultimate care for your skin and body. This creamy body butter creates a protective barrier on your skin to prevent water loss, and enhancing hydration, to deeply moisturise and soothe skin. Even your mind will benefit thanks to the subtle, yet aromatic blend of orange peel, lavender, thyme, rosemary, patchouli and mint essential oils. Infused with Arnica, Wintergeen, Black Pepper and Cinnamon Bark spices, this intense body cream doesn’t only smell deeply aromatic, but also provides warming relief with invigorating benefits for those suffering with muscular discomfort. Apply sparingly to localised, targeted areas such as back, shoulders, neck and calves. Allow the warming sensation on the skin to develop. The increase in temperature is to be expected, you may also notice high colour on the skin – this is the cream working its magic. It is the blood supply increasing, encouraging micro-circulation to relax muscle tension. To leave your body feeling soothed and comfortable.